We are pleased to announce the Youth Crisis Services Volunteer of the Month for June 2017, Kerrie Klein. Learn more about Kerrie and why she chooses to serve youth in crisis at NRS. 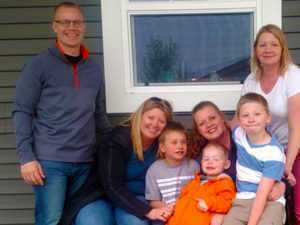 Youth Crisis Services Volunteer of the Month Kerrie Klein (center) pictured with her siblings and nephews. Tell us a fun fact about yourself. I am the eldest of four children and enjoy playing “fun aunt” to four nephews and one niece. That basically means we tend to get into a lot of trouble with their parents, and I get blamed pretty regularly for teaching them bad habits (which is probably fair). But, I can play toy cars for hours, am a master book-reader and Sponge-Bob/Paw-Patrol/ Peppa-Pig watcher, and can be easily coerced into taking seemingly indefatigable kiddos swimming up until the minute the hotel pool closes when we’re at family get-togethers. So, it all evens out. How did you first get involved with NRS? Through current and former co-workers who are long-term volunteers at NRS. 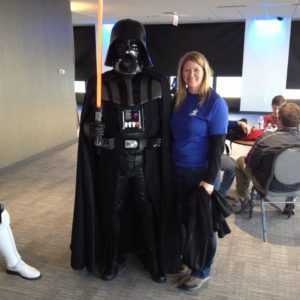 I was looking for a way to give back more to the community when they did a lunch-and-learn at work about NRS. I signed up to volunteer not long after that. 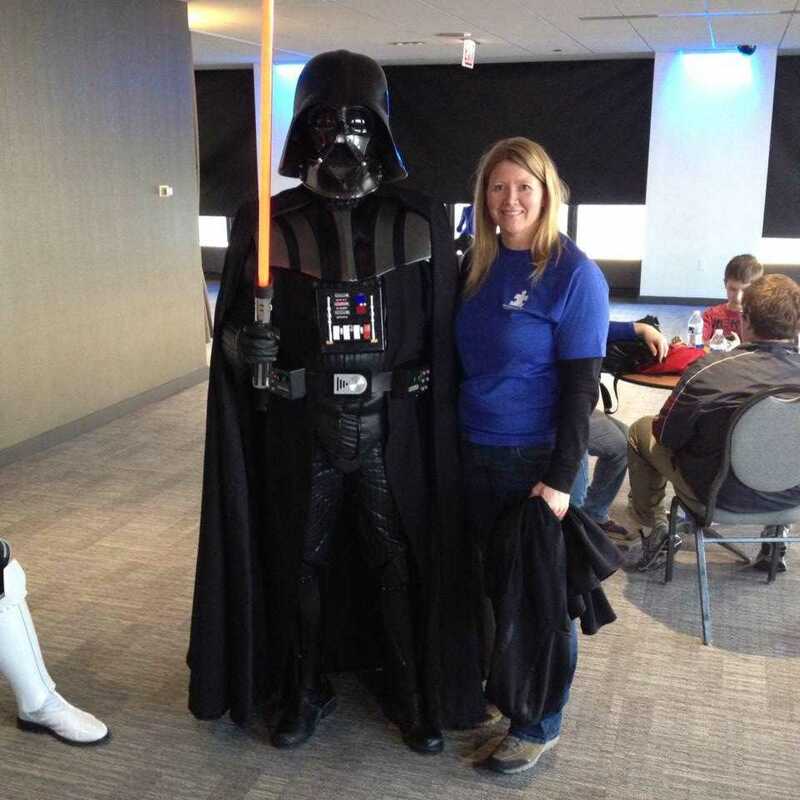 Kerrie Klein with Darth Vader at an Autism Speaks event. Why do you choose to keep coming back to volunteer? That feeling you get when you help connect a caller or chatter to the information or resources they need when they realize that there are possibilities to change whatever situation they’re facing and that there are people who want to help them. And of course, the amazing staff and volunteers in the crisis services center. Everyone has your back and there’s a really positive vibe that I think comes through to the callers/chatters. What have you gained from your experience? How important it is to really listen to someone. Not just at NRS, but in your everyday life – the training has been really valuable outside of NRS, too. It’s also opened my eyes more to the struggles people face daily, and made me want to do more to help. On a personal note, it’s also given me an appreciation for how lucky I am to have a supportive and tight-knit family. I wish everyone had that in their lives. Can you tell us about a call that stuck with you? Recently I talked with a young woman who’d left a bad situation at her mom’s place in order to preserve her own mental and physical health, but she was feeling overwhelmed and guilty because she’d left behind her sister and niece and wasn’t able to help them yet financially to leave. We talked through some possible options that might be available to her sister/niece to help change their situation, and also why it was alright for the caller to see her own well-being as a priority too. Any last thoughts? All of you are amazing! I learn so much from the other liners and supervisors just from snippets overheard from other calls. Thanks for always having my back and making volunteering at NRS an even more rewarding experience. If you are in the Chicago area and interested in becoming a youth crisis services volunteer at NRS, email our volunteer coordinator Rebecca Bowlin at RBowlin@1800RUNAWAY.org.